The United Steelworkers demanded an apology from the Wall Street Journal Oct. 24 on behalf of its 1.2 million members in the U.S. and Canada. The newspaper grossly over-reported a USW local union officer’s compensation in a vitriolic, error-filled editorial last week, ostensibly aimed at congressional Democrats who voted to trim $2 million from the Office of Labor Management Standards’ proposed $50 million 2008 budget. In a particularly mean-spirited passage designed to illustrate how union leaders are not members of the working class, the newspaper singled out USW member Jimmy Warren, a democratically elected local union financial officer from Arkansas, as receiving $825,262 in payments from his union. In reality, the financial report from his local, which is available free to the public online, clearly shows that he was compensated $8,252.62, an over $817,000 difference. The Steelworkers said that even though the newspaper printed a completely inadequate, out-of-context correction after the union lodged its complaint, the troubling fact remains that one of the world’s most widely read financial publications has displayed irresponsibility with regard to fact-checking that insults its readers, to say nothing of the paper’s obvious contempt for working men and women. 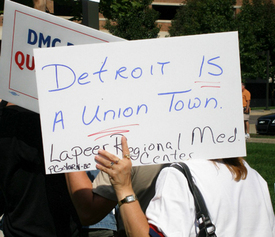 Hundreds of registered nurses were joined by autoworkers from the UAW’s Region 20 as they rallied in front of the Detroit Medical Center Oct. 4 to protest unfair labor tactics by the hospital. The nurses, along with community leaders, held a candle light vigil for patient care Oct. 18 in front of Harper/Hurtzel Hospital in Detroit. Hospital CEO Mike Duggan had threatened to use a National Labor Relations Board decision that allows the company to thwart organizing by categorizing the nurses as supervisors. Nurses at the hospital are seeking representation by the Michigan Nurses Association. The hospital has hired a union-busting firm which is seen as having had a hand in an “anti-union” demonstration by a number of the nurses later in the month. The nurses point out that it is wrong for the hospital to spend money propagandizing against the union because the hospital is a recipient of city, state and federal funds. They are asking that supporters call CEO Mike Duggan at the Michigan Medical Center, demanding that he come to a fair union election agreement with them. The Illinois State Council of the Service Employees International Union (SEIU) and the Indiana SEIU, who jointly represent more than 170,000 workers, have voted unanimously to endorse Barack Obama for president. The union represents health care workers, security guards, janitors, public workers, home health care and child care workers. In announcing the SEIU endorsement, Tom Balanoff, president of the Illinois State Council, called Obama “a real fighter for working families with a proven track record of getting things done.” Balanoff also cited Obama’s early opposition to the Iraq war as proof that he has the judgment and vision necessary to serve in the nation’s highest office. The 58,000-member Public Employees Federation has joined the growing list of unions that backs single-payer, government-administered health care. The federation said it supports the extension of Medicare to all described in bill HR 676 — the United States National Health Insurance Act. The legislation would provide comprehensive health care to everyone living in the United States. Saying the Bush-controlled National Labor Relations Board has turned its back on workers precisely at the moment it should be invigorating the protections of U.S. labor law, the AFL-CIO has filed a complaint against the NLRB with the International Labor Organization in Brussels, Belgium. The federation alleges that the NLRB has been turned into a tool that helps employers thwart union organizing rights. “Under Bush, America’s labor board has so failed our nation’s workers that we must turn to the world’s international watchdogs to monitor and intervene,” said AFL-CIO President John Sweeney. This Week in Labor is compiled by John Wojcik (jwojcik @pww.org). Jim Gallo contributed.